We have custom made round vertical planter pods available for use on our screens (as shown here) or alternatively for mounting to your own walls. 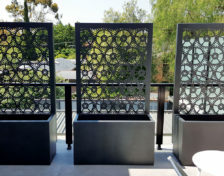 Includes polypropylene hanging pots and back panel laser cut with holes to allow pots to be mounted. 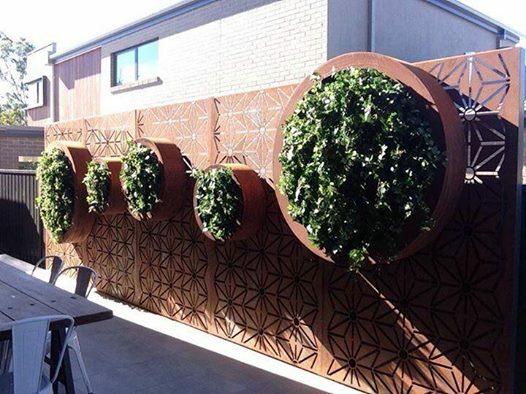 These round vertical garden pods can be mounted either to our screens or onto your own wall. Intricately designed and laser cut with precise detail and creates a stunning feature in any environment. It can be used indoors or outdoors and also looks brilliant with backlighting. All of our products are Australian designed and made at our Ballarat (Victoria) factory. Please note: SHOWN HERE WITH PLANTS INSTALLED BY OUR CLIENT.